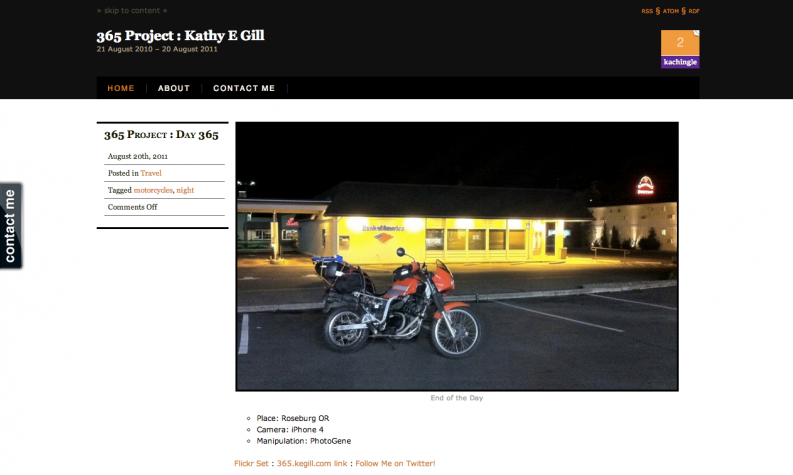 Kathy E Gill | A 365 Project - Educator, WebUX, Writer. Rabble-rouser. On my birthday in 2010, while sitting in the audience at Gnomedex, I decided to celebrate by kicking off a 365 project: a photo a day. It would also give me the incentive to actually use my domain, kegill.com, instead of shoehorning more content into WiredPen, my long-lived blog. The project quickly turned into an experiment with the iPhone4 as a pocket camera, along with all of the possibilities in the App store. I would use the technique with my digital journalism class Spring 2011: a photo a day for 10 days, subject assigned (very broadly), cellphone cameras encouraged.